The future suddenly looks a whole lot brighter for people living on one Sheffield street. A project to improve Edenhall Road off City Road is seeing a range of work to improve the quality of life for its residents. They had told Sheffield City Council they were concerned about safety and the quality of the environment on the street and since 2009 different agencies have worked together to see what they can do to improve life for people who live there. Inspector Gary Booth, from the Manor and Arbourthorne Safer Neighbourhood Team, said: “Since 2009 local agencies have worked in partnership to address the issues raised by local residents. The work of the council, Sheffield Homes, South Yorkshire Police and the Arbourthorne Centre has also seen improvements made to homes, vacant homes being brought back into use, improvements both inside and outside the Arbourthorne Centre and now one of the final pieces in the jigsaw is improving the path that links Edenhall Road to City Road. The path has already been resurfaced and a new bin installed and last week the Lord Mayor, local residents and pupils of Springs Academy planted a large, mature Pin Oak and a range of bulbs to brighten up the path. 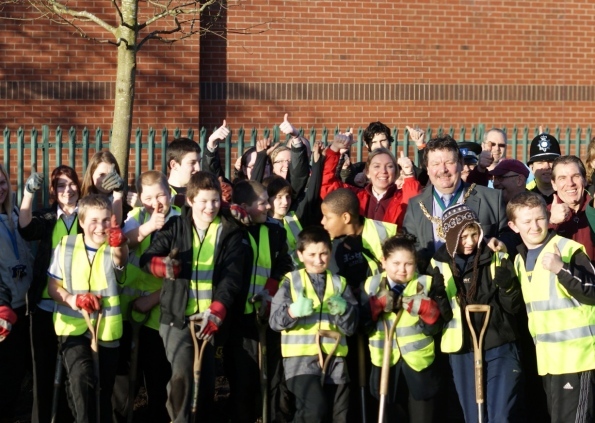 This event was organised by the Community Forestry Team at Sheffield City Council and supported by Green Estate. Later in the year unique stone carvings will be installed along the length of City Road including at Edenhall Road path space and, with support from the East Community Assembly, Green Estate’s apprentice team will maintain the space. Lord Mayor Coun Alan Law said: “It’s great to be working with the local community in this area to make the changes that really matter to them.